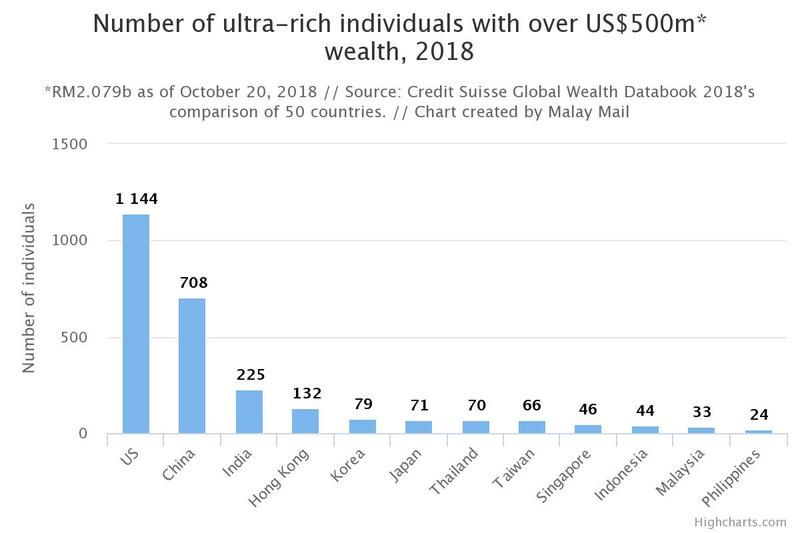 KUALA LUMPUR, Oct 21 — If you have ever wondered how many ultra-rich individuals Malaysia has, a study has shown that there are a mere 487 of them. These are individuals who have at least US$50 million (RM207.9 million) and up to US$500 million (RM 2.079 billion) of wealth, according to Credit Suisse’s Global Wealth Databook 2018 that was released earlier this week. And it’s actually about half of the number of super-rich individuals (998) in neighbouring Singapore, which is also the only Asian country to be ranked in the top 10 richest countries in terms of wealth per adult. For the record, Credit Suisse data shows the top 10 countries with mean wealth per adult above US$100,000 (RM415,800) as Switzerland (US$530,240), Australia, US, Belgium, Norway, New Zealand, Canada, Denmark, Singapore (US$283,260) and France. This is in contrast to the global figure of US$63,100 (RM262,369.80). The next group of countries is the “intermediate wealth” group with mean wealth ranging from US$25,000-US$100,000 which includes China, new EU members, those from Latin America and the Middle East. Fast-developing Asian nations like Malaysia, Thailand and Vietnam are in the next tier of “frontier wealth” (US$5,000-25,000 or RM20,790-RM103,950), along with huge and heavily populated countries like India, Russia, Brazil, Indonesia, Philippines and Turkey. The frontier wealth group also includes most of Latin America, Mediterranean border nations, transition nations outside the EU, South Africa and other leading sub-Saharan nations. The remaining countries — mostly in central Africa and central and south Asia — have wealth per adult of below US$5,000. Malaysia, which has been wanting to join the high-income nation category for years, is in fact categorised as an “upper middle-income” country with total wealth as of this year at US$1,988 billion (RM8,266 billion) or at 0.6 per cent of the global wealth. Malaysia’s wealth per adult almost quadrupled from US$23,853 (RM99,180) in 2000 to US$93,004 (RM386,710) in 2018, the Credit Suisse databook showed. But zooming back in to the 487 ultra-rich individuals as of this year, only 33 of them have a wealth of at least US$500 million or RM2 billion. Out of these 487 persons, 184 are either already billionaires or have at least RM415 million assets (US$100 million-US$500 million category), and the remaining 270 are in the US$50 million-US$100 million (RM207.9 million-RM415 million) category. One step below the ultra-high net worth (UHNW) individuals are 46,215 individuals who are categorised as high net worth (HNW) individuals, namely 2,697 in the US$10 million-US$50 million (RM41.58 million-RM207.9 million) category, 3,963 in the US$5 million-US$10 million (RM20.79 million-RM41.58 million) category, and a significantly larger number of 39,555 individuals in the US$1 million-US$5 million (RM4.16 million-RM20.79 million) category. As a whole when compared against all five ultra-rich and rich wealth categories, Malaysia is placed at the 39th spot out of a select 50 countries compared by Credit Suisse. Singapore is at the 21st spot. Looking at just those in the US$500 million and above (RM2 billion) category out of these 50 countries, US is unbeatable with 1,144 billionaires, while China is second with 708 billionaires, followed by India (225), Germany (203), Russia (161), Hong Kong (132), UK (117), Switzerland (97), Italy (92), Canada (85), Australia (80), Korea (79), Japan (71), Thailand (70), Taiwan (66), France, Turkey (64), Brazil (63), Spain and Sweden (61). Singapore has 46 of such billionaires, followed closely by Indonesia (44), Mexico (39), Israel (36), and then Malaysia at 33, piping countries such as Norway (30), Austria, Finland, Netherlands (28), Saudi Arabia (27), UAE (26), Ireland (25), Philippines, Czech Republic (24) and Denmark (20). Rounding this up is Peru (18), Poland (17), Colombia, Belgium, New Zealand (16), Chile (15), Greece, Portugal, Kuwait (13), Argentina, South Africa (10) and Romania (3). Hungary, Vietnam, Pakistan had none in this category. While the identities of the billionaires and millionaires were not listed in the global study, Credit Suisse offered an insight into the profile of such individuals which it said was heavily concentrated in particular regions and countries. Even when they live in different continents, these UHNW and HNW individuals tend to share similar lifestyles and participate in the same global markets for luxury goods, Credit Suisse said. “The wealth portfolios of these individuals are also likely to be more similar, with more of a focus on financial assets and, in particular, equity holdings in public companies traded in international markets,” it said in the databook. In the definition used by Credit Suisse, net worth or wealth is defined as the value of financial assets and non-financial assets (mainly housing) owned by households, after deducting their debts. 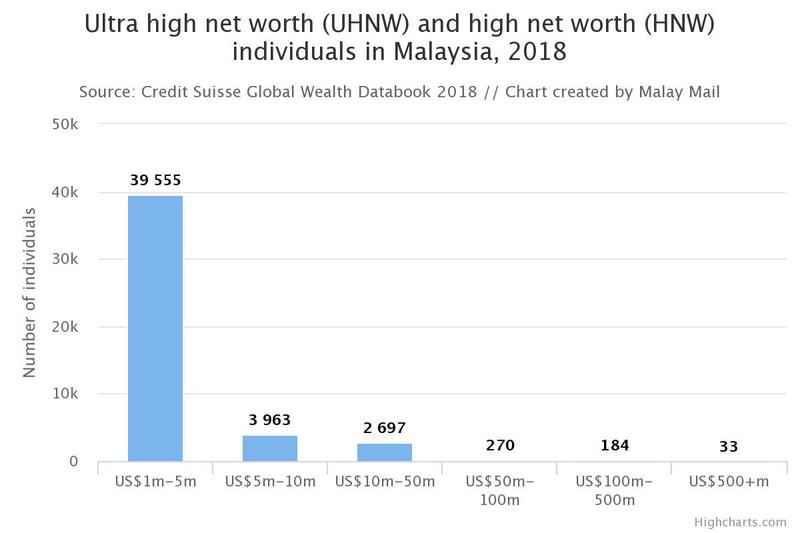 If it feels like the super-rich are an exclusive club in Malaysia, that’s because these 46,702 UHNW and HNW individuals collectively only amount to 0.2 per cent (not even the proverbial 1 per cent) of the 21.372 million adults in Malaysia. 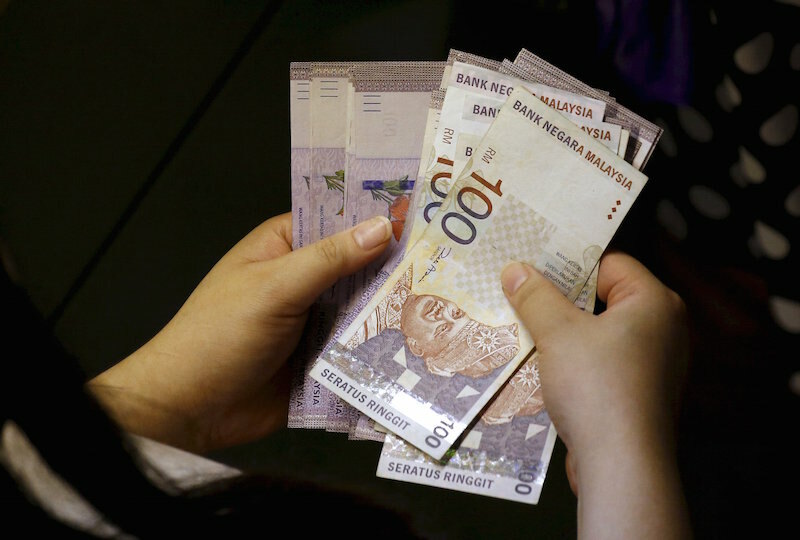 The remaining 99.8 per cent Malaysian adults have a wealth that either touches or falls below US$1 million (RM4.16 million), with the bulk or 60.6 per cent with wealth below US$10,000, while 36.2 per cent have wealth of US$10,000-US$100,000, and three per cent at the higher wealth range of US$100,000-US$1 million. Malaysia also has a relatively high Gini index value of 82 per cent based on the wealth distribution patterns among Malaysian adults, which suggests high wealth inequality. As for Malaysian households, 685,000 in Malaysia earn more than US$100,000, while 47,000 households earn more than US$1 million. 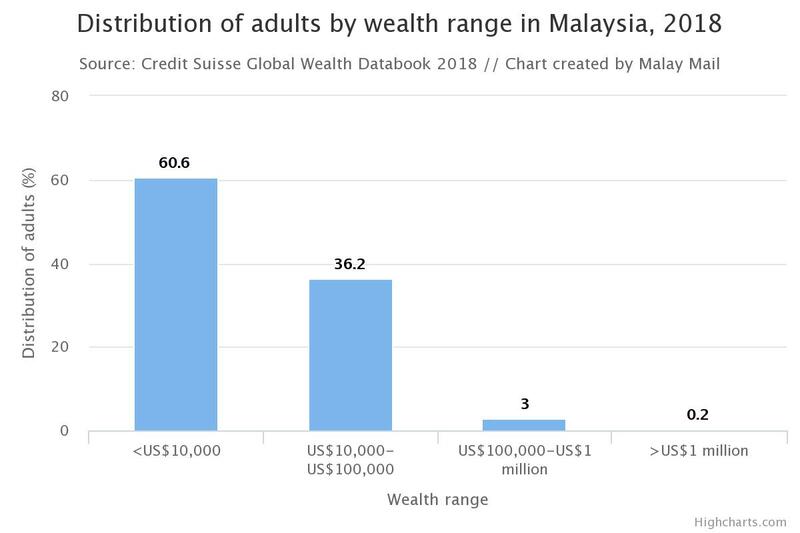 But this wealth gap is not unique to Malaysia, as a fairly similar breakdown in terms of wealth distribution among adults is seen globally: 63.9 per cent (below US$10,000), 26.57 per cent (US$10,000-US$100,000), 8.68 per cent (US$100,000-US$1 million), 0.84 per cent (above US$1 million). Credit Suisse notes that this means 63 per cent of the global population has only 1.9 per cent of global wealth, while only 0.8 per cent of adults are millionaires that collectively own 45 per cent of all assets. Credit Suisse also said an adult only needs US$4,210 in assets after subtracting debts to be counted as among the wealthiest half of the world as of mid-2018. “However, a person needs at least US$93,170 to belong to the top 10 per cent of global wealth holders and US$871,320 to be a member of the top 1 per cent. Taken together, the bottom half of the global population own less than 1 per cent of total wealth. “In sharp contrast, the richest decile hold 85 per cent of the world’s wealth, and the top percentile alone account for 47 per cent of global assets,” it said. Earlier this week, Khazanah Research Institute’s latest report highlighted the inequalities for Malaysians, but with a different focus on households and income inequality instead of individuals and wealth. Read here to find out why you may feel that the rich are getting richer; and why a ‘rich’ household in Kelantan may be considered low-income in Kuala Lumpur; and the troubling realities of low-income households where those earning below RM2,000 monthly may be left with just RM76 after expenses. *Currency conversion rates as of October 20, 2018.